Marjorie was born December 7, 1926 on a farm east of Arlington, Nebraska. She graduated from Fremont High School in 1944. Marjorie then went to C.E. Commercial School in Omaha and after graduating from there, she worked for K-B Printing Company then moved back to Fremont and worked for Standard Parts Company. Marjorie married Lloyd McDuffee in the First Congregational Church, UCC on May 22, 1947. She then worked for Gambles Warehouse and as a bookkeeper for Fremont Cake and Meal before becoming a stay at home mom raising her three children Linda, Butch and Gary. Marjorie went back to work as the Fremont Police Department bookkeeper from 1969-1978, then to Kem Vet Supply Company until 1984 when Lloyd retired. The couple moved to Long Pine, NE. for the summers and traveled back and forth to Pahrump, Nevada for the next 21 winters. 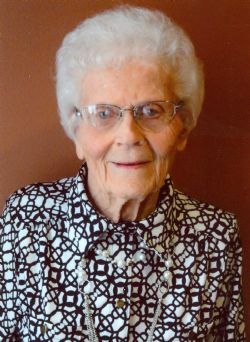 Marjorie was a member of the First Baptist Church in Fremont and Grand Island where she was in charge of the youth groups at both churches. She was involved with Cub Scouts and Girl Scouts in Grand Island. She liked bowling, softball, golfing, playing cards, camping and traveling to visit family and friends. Marjorie and Lloyd joined First Lutheran Church in Fremont in 1976. Gary (Carole) McDuffee of Chandler, AZ. Marjorie was preceded in death by her husband Lloyd on August 2, 2009, infant son Doyle, sister Eleanor Smith. The memorial service will be Wednesday, 10:30am at the Ludvigsen Mortuary Chapel in Fremont. Burial will be in Ridge Cemetery. Memorials are suggested to the Fremont Public Schools Foundation or First Lutheran Church. The family will be at the funeral home Wednesday beginning at 9:30am to receive friends.